words and translations by Oxford University Press. Camera search files with the Optical Character Recognition. Learn new word every day with the Word of the day option. 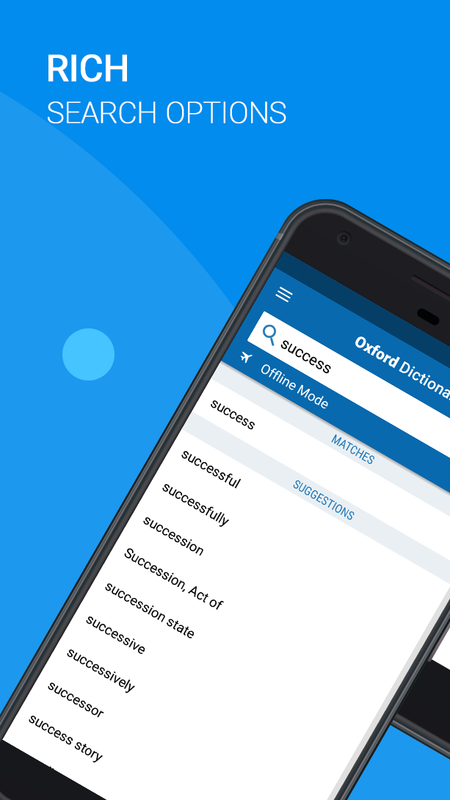 Structure your studies with Favorites lists of words, check your Recent searches and see your last look ups. 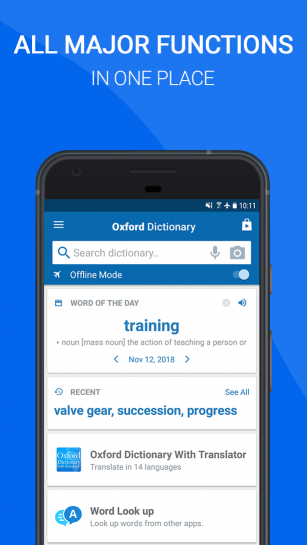 Oxford Dictionary of English version 10 is here boasting an even greater catalog of words and senses, thanks to the latest 2018 update from the Oxford University Press. WHAT MAKES OXFORD DICTIONARY OF ENGLISH BETTER THAN OTHER DICTIONARIES? The Oxford Dictionary of English is the mobile version of the Oxford University Press' Oxford English Dictionary, widely accepted as one of the highest authorities in the study of English with more than 150 years of research behind it. Regarded as one of the flagship products in MobiSystems' large catalog of dictionaries the app features advanced search and language tools designed by a developer vastly experienced in the creation of dictionaries and learning tools. 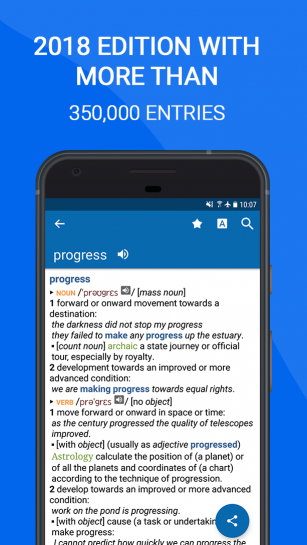 Tailored to professionals, students, and academics, as well as anyone who needs a comprehensive and authoritative dictionary of current English at work or at home. NEW! Stay up-to-date with the very latest words and expressions, brought to you by the most recent 2018 database update by the Oxford University Press. The very latest vocabulary, with over 350,000 words, phrases and meanings. 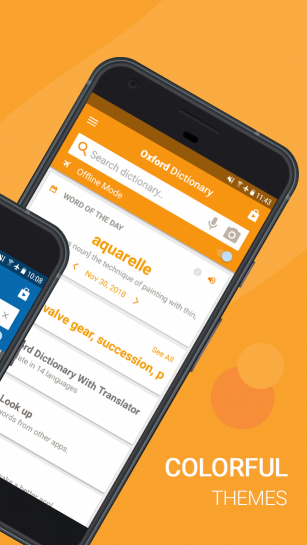 With tens of thousands of regionally specific entries The Oxford Dictionary of English reflects the unique richness and global adaptability of English. Have the strength of The Oxford English Corpus' research excellence at your finger tips. 75,000 audio pronunciations of both common and rare words, including those with varying pronunciations (Premium only). With the addition of a convenient Home page, a sleeker and more intuitive visual layout, as well as innovations in the speed of searches you can delve right into the intricacies of English faster and easier than ever! Translate words while using other apps with our Tap to Translate feature. Learn and translate in style with one of four beautiful themes. 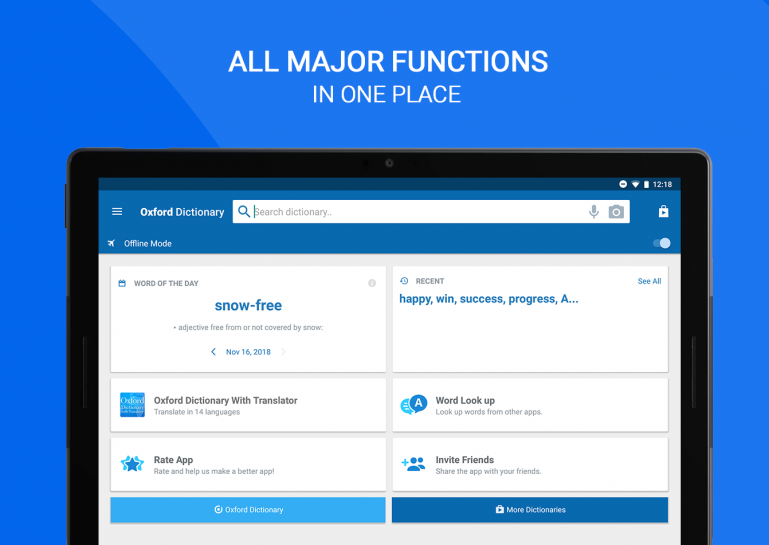 SEARCH TOOLS - quickly find words thanks to a clear, functional, and easy-to-use interface. 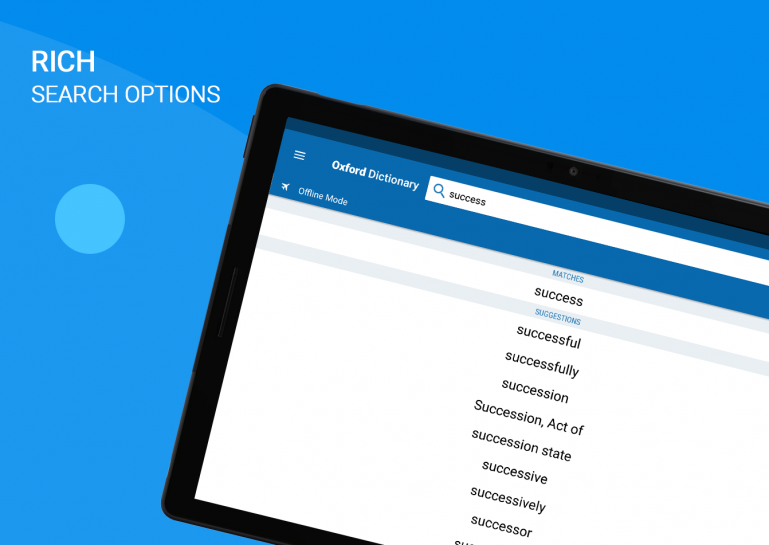 Search autocomplete helps you quickly find words by displaying predictions as you type. 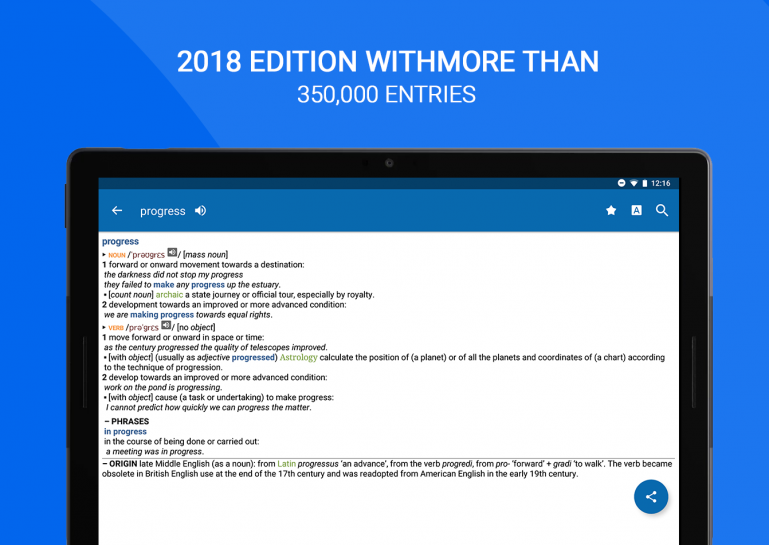 Keyword lookup allows you to search within compound words and phrases. Looking for a specific word but don't know how it's spelled? We've got you covered with our automatic ‘Fuzzy filter’ to correct word spelling, as well as ‘Wild card’ ('*' or '?') to replace a letter or entire parts of a word. Camera search looks up words in the camera viewfinder and displays results in seconds. Voice search helps you when you don't know how an entry is spelled. Tap to Translate enables you to look up entries in other apps. Share word definitions via installed apps on your device. LEARNING TOOLS - engaging features that help you enhance your vocabulary. The 'Favorites' option allows you to create custom folders with lists of words from the vast library of entries. Recent list to easily review looked-up words. Audio pronunciation - Learn words faster by listening to how they're pronounced. Offline mode - No WiFi, no problem. Save words on your device to be viewed without the need of an internet connection. Priority support - Get expedited support for any app-related issues. No ads - no more in-app advertisements. Policy on the use of "cookies"
Our goal is to be the most useful visitors to our web-site. Therefore we collect information during your visit here by using "cookies". As you continue to browse the web-site of MobiSystems, you agree to the use of "cookies". If you do not want to accept "cookies", you can disable them via your browser settings.